Amsterdam, 1662. 1st Edition 1st Printing. No Binding. Very Good +. Copper Engraved Map , 17.2 X 12 Cm With 1/2 Cm Margins. 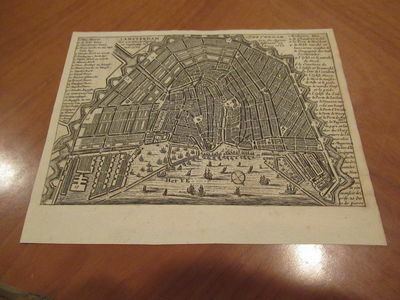 Issued In Amsterdam 1662?. Uncoloured., Clean. Bird's-Eye Plan Of Amsterdam. Part Of A Large Collection Of Original Antique Engravings Formed By A Southern California Artist In The Early To Middle Twentieth Century. Each Plate Has Small Glue Marks On Reverse Where They Were Tipped In To An Album.